One of the most popular ice fishing lakes in southern British Columbia is Monte Lake. Thanks to the Freshwater Fishery Society of BC, this lake has been aggressively stocked with Triploid Kokanee and Blackwater Rainbow Trout. 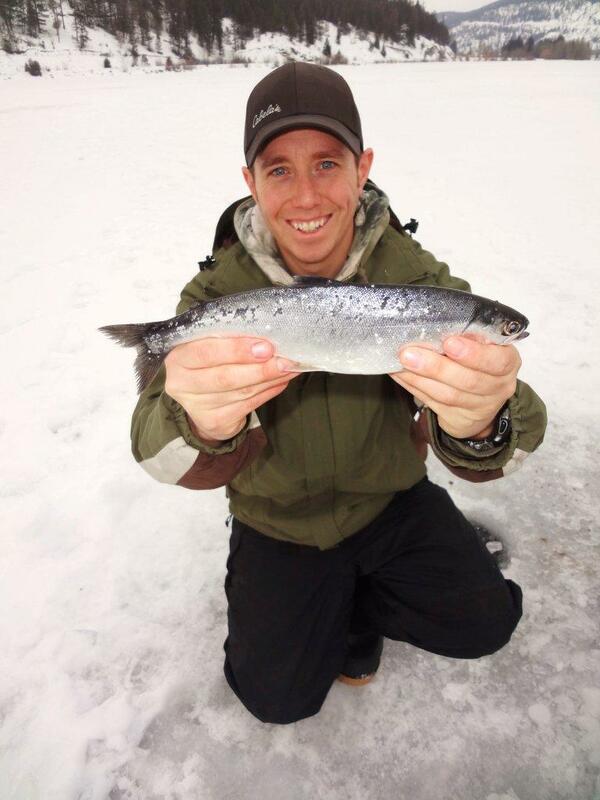 Approximately 25,000 Kokanee and 15,000 Rainbows are stocked in Monte Lake each year. Monte Lake is located approx. 45 kms SE on Hwy 97 from Kamloops and 25 kms NW from Falkland. The lake is just off the highway which makes access very easy. The lake is a good size with a surface area of 435 acres and max depth of approx. 120 feet There are many hot spots to try your luck. When targeting trout, work along the edges of the lake in the shallower water, 5 to 25 feet deep. The lake narrows off a bit near the mid-section just south east of the boat launch. Work the ledges and drop off points. The very south east end near Pringle Creek can produce good action for rainbows as well. 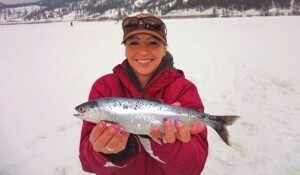 The North West end of the lake is a popular Kokanee spot, about 200 feet from the end of the lake. There is a drop off that goes from about 50 feet of water to 100 feet of water. Majority of anglers ice fish Monte Lake for Kokanee as they average in good size between 1-3lbs, not to mention that Kokanee make superb table fare! To target these Kokanee you will need to fish the deeper waters. The use of a fish finder will definitely turn the odds in your favour! The sonar unit is useful to discover the water depths and to find where the fish are suspended. If you don’t have a sonar start off by fishing between 10 and 20 feet of water, then work deeper as the day gets later. The presentation of choice is a 4 to 5 inch silver flasher with 12 to 18 inch leader. (Don’t forget to add a small split shot weight on the middle of your leader to stop it from tangling) End it off with a small teardrop glow hook tipped with pink maggots or died red kreel. Jig every few seconds as Kokanee like a lot of movement to entice the bite. The bite is very soft and subtle so don’t put the rod down. Hook sets are free so take as many as you want! 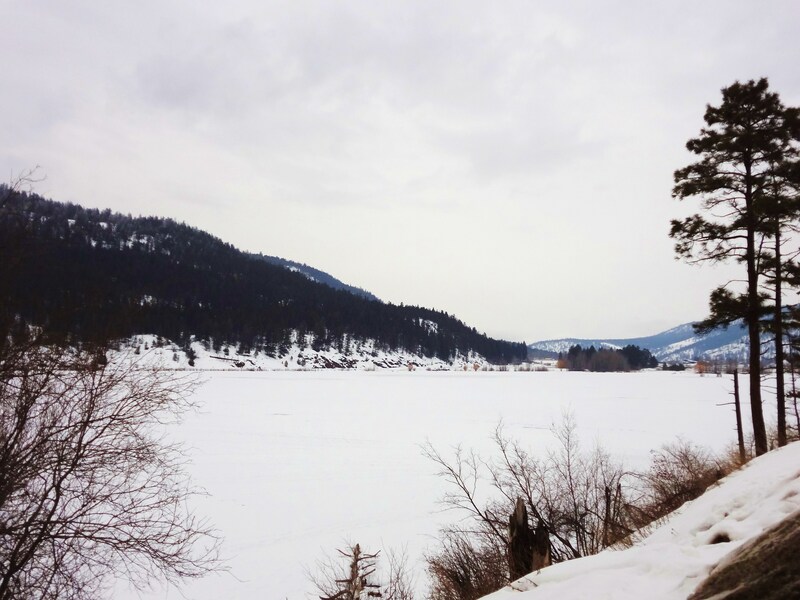 This lake receives a tremendous amount of ice fishing pressure but don’t let that discourage you as the lake has been well stocked. The lake can sometimes have over 200 people on it in a day! Upon your first visit to this lake stick fairly near where the clusters of anglers are (within 75 feet), they are there for a reason! Once you get a feel for the lake then go have fun exploring your own hotspots. I have found the ice fishing to be best in the early part of the day between 8am and 12pm. The wind picks up very quickly so be sure to wear plenty of layers to keep warm. For any further information regarding fishing Monte Lake please feel free to contact the BCFishn.com team or reach us on our facebook page!